However, not everyone may want to use the Bluetooth feature. When not utilizing Bluetooth to connect to any external device, leaving it on and enabled will definitely use more power, and hence draining the battery faster. In addition, one less wireless radio wave also reduces the potential source of interference with other devices. 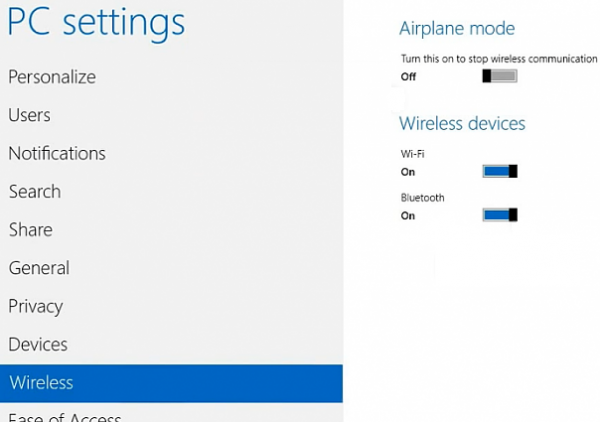 Here’s the guide on how to turn off and turn on (should you need to use the Bluetooth) Bluetooth connectivity in Windows 8, Windows 8.1, which also works for Windows RT, Windows RT 8.1. Note that the change of Bluetooth on or off setting does not affect Wi-Fi or cellular mobile broadband connectivity. However, Airplane mode may override the configuration to disable the Bluetooth if it’s turned on, or enabling Bluetooth may turn off Airplane mode automatically. Open the Charm bar by moving the mouse to one of the corner on the right or sliding in from the right, and select Settings. 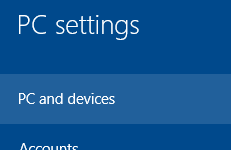 Then, click or tap on Change PC Settings (more ways to open the PC Settings). Click or tap on PC and devices. Click on tap on Bluetooth. In the right pane of Manage Bluetooth devices, slide the Bluetooth slider to disable (turn on) or enable (turn off) the Bluetooth. The current on or off status is instantly reflected on the screen. In Windows 8.1, in addition to method mentioned above, you can also use the following way to disable or enable Bluetooth. Click or tap on Network. Then, click on tap on Aeroplane mode. In the right pane, under Wireless devices, slide the Bluetooth slider to disable (turn on) or enable (turn off) the Bluetooth. The current on or off status is instantly reflected on the screen. If you haven’t upgraded to Windows 8.1, and is still using Windows 8, the steps to turn off or turn on Bluetooth is slightly different. Click or tap on Wireless.